Samsø is a Danish Island situated in arm of the North Sea with twenty-two villages. For the past decade or so, Samsø has been the site of an unlikely social movement. In the late nineteen-nineties, the island’s forty-three hundred inhabitants had a "conventional attitude" toward energy. Most residents heated their houses with oil, brought in by tankers and used electricity imported from the Danish mainland via cable, much of which was generated by burning coal. At this time, each Samsinger put into the atmosphere, on average, nearly eleven tons of carbon dioxide annually. removing their oil furnaces and replaced them with heat pumps. 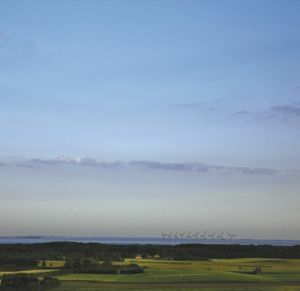 By 2001, fossil-fuel use on Samsø had been cut in half. By 2005, the island was producing from renewable sources more energy than it was using.